The microstructure, texture, residual stress, and tensile properties of Mg–6Zn–2Y–1La–0.5Zr (wt%) magnesium alloy were investigated before and after extrusion process, which performed at 300 °C and 400 °C. The microstructural characterizations indicated that the as-cast alloy was comprised of α-Mg, Mg–Zn, Mg–Zn–La, and Mg–Zn–Y phases. During homogenization at 400 °C for 24 h, most of the secondary phases exhibited partial dissolution. Extrusion process led to a remarkable grain refinement due to dynamic recrystallization (DRX). The degree of DRX and the DRXed grain size increased with increasing extrusion temperature. The homogenized alloy did not show a preferential crystallographic orientation, whereas the extruded alloys showed strong basal texture. The extrusion process led to a significant improvement on the compressive residual stress and mechanical properties. 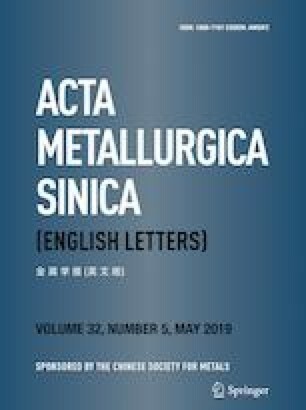 The alloy extruded at 300 °C exhibited the highest basal texture intensity, the compressive residual stress and hardness, and yield and tensile strengths among the studied alloys. This study is financially supported by the Scientific Research Projects of Karabuk University (KBU-BAP-16/1-DR-075).